Shares of Gammon India on Monday fell over 17 per cent in morning trade on the Bombay Stock Exchange following an accident at Delhi Metro at a stretch for which the company was the contractor. Gammon India opened weak on the BSE and plunged further to a low of Rs 133, down 17.49 per cent over the previous close on the exchange. Similar movement was witnessed in the National Stock Exchange, where the scrip dipped 19.44 per cent to a low of Rs 130.15. On the volume front, over 9.80 lakh shares got traded on both the bourses. 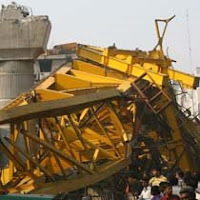 Six persons were killed and 15 others injured when an under-construction bridge of the Delhi Metro collapsed in the national capital yesterday. Marketmen said investors became jittery on concerns that Gammon India, which was acting as the contractor for the project, would now be pulled up by the authorities for the worst mishap involving the modern transport system. Besides, DMRC Chief E Sreedharan had said he would decide on the action to be taken against Gammon India after taking stock of the entire situation. Shares of Gammon were later quoting at Rs 145.45, down 9.77 per cent and with a loss of 9.87 per cent at Rs 145.60 on the National Stock Exchange at 1043 hrs.